Prior versions: Sept 2015, Jan 2015, June 2013. 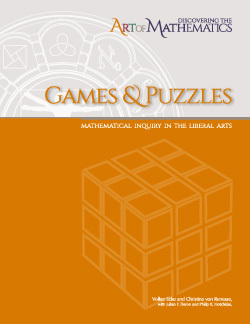 The learning guide “Discovering the Art of Mathematics: Games and Puzzles” empowers you, the explorer, to investigate connections between mathematical ideas and concepts and the structures and patterns found in games and puzzles. Pick up a Rubik's Cube and explore group theory while analyzing the powerful moves that you discover. Investigating puzzles like Sudoku, you will come to understand the intricate mathematical structure to allow you to create your own puzzles, and learn about deep connections to the mathematics of medical imaging. Inquiring into good moves and strong positions in connection games like "Hex" reveals mathematical patterns for your own strategies for being successful in this game. A seemingly simple game of piles can help you explore connections to how computers think.